In partnership with local artists and arts organizations, the Autry Museum of the American West will be hosting new installations at the Southwest Museum Site in May and June this summer. Information on the exhibitions and artists are below. And once again, the Southwest Museum site will participate in the annual Museums of the Arroyo event on May and Lummis Days in early June. Look for more details on both of these festivals in the coming months. Opens Sunday, May 20, Noon–5:00 p.m.
Of this body; of this earth is an investigation of the historical and mythological overlaps of earth, body, and tool through the lens of the body’s elemental composition. By exhibiting raw materials, handmade tools, diagrammatic drawings, and a recorded monologue, artist Miller Robinson aims to understand and connect the dots between matter, time, and body. Organized by Holiday, a non-location-based, interdisciplinary curatorial project founded by Luke Forsyth and Pejman Shojaei. A California icon and founder of the historic Southwest Museum, Charles Lummis was more than a collector: He participated in creating a national narrative of discovery and exploration. Through archaeological objects and associated photographs, maps, and archival materials, Making a Big Noise reveals stories about Lummis and his journeys, including his “Tramp Across the Continent”—a cross-country trek from Ohio to L.A.—and his archaeological expeditions in New Mexico, Peru, and Mesoamerica. Sunday, May 20, Noon–5:00 p.m. Celebrate the art, architecture, and history of the Arroyo Seco area! This free community day is presented in partnership with the Gamble House, Heritage Square Museum, the Los Angeles Police Museum, the Lummis Home and Garden, and the Pasadena Museum of History. Saturday and Sunday, June 2 and 3, 10:00 a.m.–4:00 p.m. Discover the creativity of Northeast Los Angeles through this weekend of art, music, and poetry. 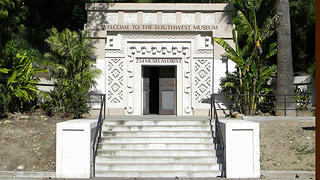 The annual festival celebrates the legacy of legendary author, journalist, and historic Southwest Museum founder Charles Fletcher Lummis.